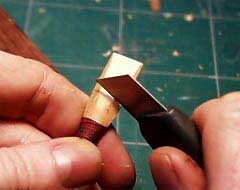 Take a very sharp knife and carefully carve away the bark until you'll end up with something that looks like a church window or a finger nail. 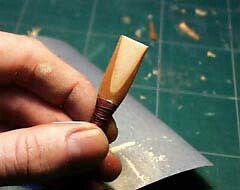 Don't carve to deep especially on the base of the reed close to the binding because in this area 'lives' the E and E'. Now carve the 'second' scrape. 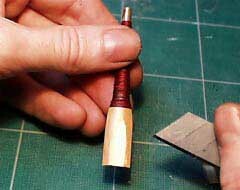 Just remove cane on the sides, leave the center of the reed as it was. 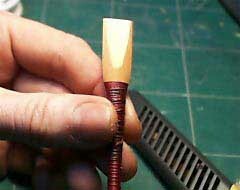 If you make the center to thin you'll end up with a reed that is reluctant to play in the second octave. Stop when you have something like this. 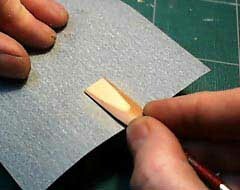 Use sandpaper to remove all the irregularity's. 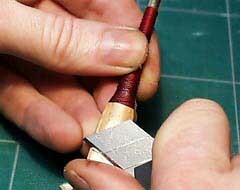 Make sure that the scrapes are identical on both sides. 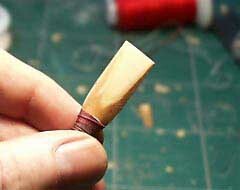 If they're not you'll get a squeaky reed. When done it will looks like this. 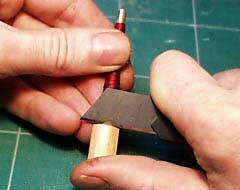 Use a knife to get the 'second scrape' back, but very gently.